We are in the middle of the holiest week in our faith. This week is supposed to really mean something to us. It ought to resonate in our Spirit. The work of the cross. The sacrifice of Christ. The sufferings; oh beloved, the sufferings. I remember being raised Catholic and not understanding why they called it "Good Friday." After all, what they did to Jesus sure didn't seem good. What He had to go through sure didn't seem good. Now as a born again believer I understand that it was supposed to be me on that old wooden cross. 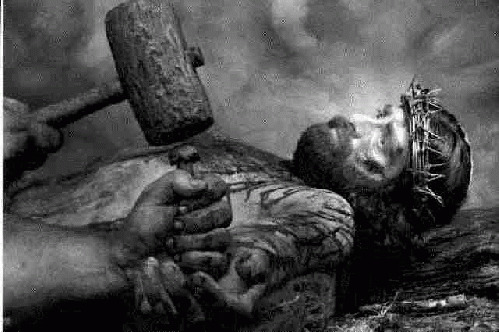 The scourging He took was supposed to be mine. The crown of thorns shoved into His brow was supposed to be mine. The spikes through the wrists and feet were supposed to be mine. The spear in the side was supposed to be mine. The sufferings were supposed to be mine but He took them for me and praise God that is good. The Bible says that God wrote these things down in Scripture that we might learn from them. That the Word of God is good for all teaching and correcting. There are warnings after warnings in the Bible about these end times we live in. Warnings about the Great Apostasy we see occurring within the walls of the church today. Yet despite these we see the falling away intensify as man's defiance before God deepens. Of course they cannot see it. They get dressed up every Sunday and play church. They pay their money to support their apostate church. They deify their pastor and his heresies. They deify their church and worship at the altar of their new building fund. They throw 5% of the millions raked in towards missions so they can ease their souls about how much money is wasted on the esthetic carnality of their church production. I used to wonder how people can do it. How could they openly profess Christ yet participate in the corruption of His bride? Sure there are many who are falsely converted due to the flawed purpose driven model but how can someone genuinely converted be so deceived? Then I am reminded every year during this week how far removed the church is from the sufferings of Christ. The sufferings of Christ? What are you talking about preacher? Exactly. Of all weeks in the year, this is the one we should hear about the crown of thorns and the blood dripping into the eyes of Christ. We ought to hear about the spear thrust into His side. We should be hearing about the scourging and the carrying of the cross down the Via Dolorosa. We won't however in the vast majority of churches in this country. We will not hear about it on Friday and we certainly will not hear about it on Sunday. We will dance and sing songs of merriment about the tomb being empty and Jesus being alive but nothing about how we got there because the church today is all about the crown of glory. The crown of thorns? Ehh"not so much. Why? Because you can sell the crown of glory. You can market that into a four part sermon series that will sell tapes and DVDs. You can convince the unsaved goats to come back and join your social club by promising them this fantastic crown of glory. That they are destined to reign. That this is their best life now. It is palatable. It is seeker friendly. But beloved, you do not get to the crown of glory without first sharing in the crown of thorns. We do not get to the empty tomb without first stopping at Calvary. Beloved this does not have to be material worth either. Anything we value more than Christ can prevent us from entering heaven. Look at the equation Paul outlines for us here. In order to gain Christ we must suffer the loss of all things in this world. Not only that, we must look upon the things of this world as utter garbage. That is what rubbish means! We cannot dance on the fence between the world and Christ. There has to be a clear delineation between the two. That is why the Bible says we can have no fellowship with darkness. We can have nothing in common with this world because it detracts from Christ. The more we are found in the world then the less we are found in Christ.